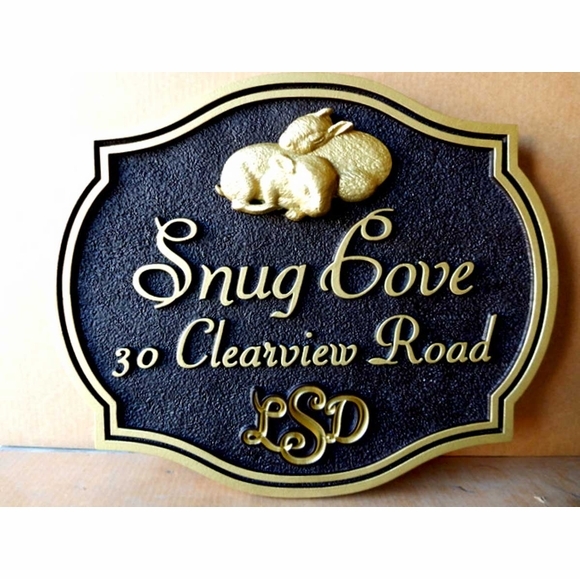 Custom Address Sign with Bunnies - - 20x20 residential house or family name address plaque with monogram on the bottom. Wall mount. Made in USA. Features two carved 3-D bas-relief baby bunnies snuggling together that were modeled from a painting. Carved and sandblasted High-Density-Urethane (HDU) property name and address sign for a residence. HDU is lightweight, strong, unaffected by temperature, and waterproof. The wording, double border, and bunnies are raised above the HDU substrate. The background is sandblasted into a sandstone texture. Wording and border are painted with metallic gold paint, and the entire sign is then clear-coated twice for additional UV protection. Bunny theme address sign is personalized with the house or family name, address, and monogram at the bottom. Name line holds up to eleven (11) characters. Address line holds up to seventeen (17) characters. INSTALLING YOUR SIGN: This sign is sold without mounting hardware. Optional Z-clips are available. Please use the Select option drop-down box to tell us whether you want the sign only or the sign and clips. Select the 'sign only' option if you want to provide your own hardware. For example, you might want to drill mounting holes on the corners of the sign (inside the border in the corner is a good spot) and mount with screws appropriate for the surface. Select the 'sign and Z-clips' option if you want to receive a set of Z-clips with your sign. One clip goes on the back of the sign, and one goes on the wall as shown in the small image above. Color: black surface with gold. Dimensions: 20"W x 20"H x 1.5" thick. Colors as shown in the sample. House name on sign above: Snug Cove.